Carlos Castro netted a late winner as La Liga strugglers Sporting Gijon came from behind to beat second-placed Atletico Madrid at El Molinon. France forward Antoine Griezmann gave Diego Simeone's side a first-half lead with a superb free-kick. But Antonio Sanabria equalised for Abelardo Fernandez's men on 79 minutes before Castro tapped home Jony's low cross with a minute left on the clock. With eight games left, Atletico trail leaders Barcelona by eight points. Luis Enrique's side, who have a game in hand on Atletico, can extend their lead at the top of La Liga to 11 points if they beat Villarreal at El Madrigal on Sunday. Atletico seemed on course for a fifth consecutive league win just before the half-hour mark, when Griezmann floated an inch-perfect free-kick from 25 yards over the wall and into the top corner of Ivan Cuellar's goal. But the visitors, who played 120 minutes in the Champions League on Tuesday before beating PSV Eindhoven on penalties, lost their focus in the second half. Sanabria equalised with a free-kick that deflected off Atleti midfielder Matias Kranevitter and past goalkeeper Jan Oblak. Castro then hit the bar for Gijon following Sanabria's low cross from the left. 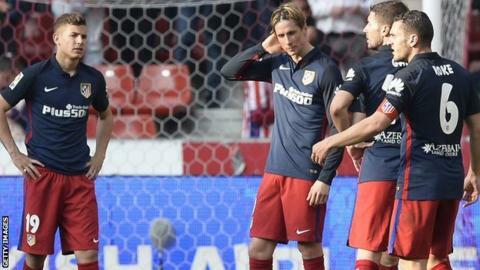 Atleti went down to 10 men for the final moments of the match, following an injury to defender Jose Gimenez after Simeone had already made his three substitutions. Spain Under-21 international Castro took advantage to score the winner and secure a first league victory for Gijon since 31 January. Gijon, who started the match in the bottom two and three points from a position of safety, remain in the relegation places following Granada's 2-2 draw with Rayo Vallecano on Saturday evening. Match ends, Sporting de Gijón 2, Atlético de Madrid 1. Second Half ends, Sporting de Gijón 2, Atlético de Madrid 1. Carlos Castro (Sporting de Gijón) wins a free kick on the right wing. Substitution, Sporting de Gijón. Rachid replaces Antonio Sanabria. Carlos Carmona (Sporting de Gijón) wins a free kick in the defensive half. Goal! Sporting de Gijón 2, Atlético de Madrid 1. Carlos Castro (Sporting de Gijón) right footed shot from very close range to the bottom right corner. Assisted by Jony. Carlos Castro (Sporting de Gijón) hits the bar with a left footed shot from the centre of the box. Assisted by Antonio Sanabria. Nacho Cases (Sporting de Gijón) is shown the yellow card for a bad foul. Foul by Nacho Cases (Sporting de Gijón). Matías Kranevitter (Atlético de Madrid) wins a free kick in the defensive half. Corner, Sporting de Gijón. Conceded by Lucas Hernández. Attempt blocked. Carlos Castro (Sporting de Gijón) right footed shot from the centre of the box is blocked. Attempt blocked. Fernando Torres (Atlético de Madrid) right footed shot from the centre of the box is blocked. Assisted by Saúl Ñíguez with a headed pass. Attempt blocked. Jony (Sporting de Gijón) left footed shot from the left side of the box is blocked. Assisted by Sergio Álvarez. Alberto Lora (Sporting de Gijón) wins a free kick on the right wing. Dangerous play by Saúl Ñíguez (Atlético de Madrid). Goal! Sporting de Gijón 1, Atlético de Madrid 1. Antonio Sanabria (Sporting de Gijón) from a free kick with a right footed shot to the centre of the goal. Nacho Cases (Sporting de Gijón) wins a free kick in the attacking half. Foul by Matías Kranevitter (Atlético de Madrid). Attempt missed. Jony (Sporting de Gijón) left footed shot from the left side of the box misses to the right. Assisted by Carlos Carmona with a cross. Antonio Sanabria (Sporting de Gijón) hits the right post with a right footed shot from outside the box. Assisted by Carlos Carmona from a direct free kick. Juanfran (Atlético de Madrid) is shown the yellow card for a bad foul. Isma López (Sporting de Gijón) wins a free kick in the attacking half. Substitution, Atlético de Madrid. Juanfran replaces Luciano Vietto. Nacho Cases (Sporting de Gijón) wins a free kick in the defensive half. Corner, Atlético de Madrid. Conceded by Jony. Corner, Sporting de Gijón. Conceded by Gabi. Attempt blocked. Antonio Sanabria (Sporting de Gijón) left footed shot from the centre of the box is blocked. Assisted by Carlos Carmona. Substitution, Sporting de Gijón. Carlos Carmona replaces Pablo Pérez. Attempt saved. Pablo Pérez (Sporting de Gijón) right footed shot from the right side of the box is saved in the centre of the goal. Assisted by Carlos Castro with a through ball. Pablo Pérez (Sporting de Gijón) is shown the yellow card for a bad foul. Foul by Pablo Pérez (Sporting de Gijón). Jorge Meré (Sporting de Gijón) wins a free kick in the defensive half. Foul by Luciano Vietto (Atlético de Madrid). Jorge Meré (Sporting de Gijón) is shown the yellow card for a bad foul.